We love working on your Toyota, but we’re even more passionate about your safety. Because fitting the right tyres is only half the story - they need to be regularly checked and maintained to make sure they’re performing to their maximum capacity. Your braking, steering, economy and driving performance are all affected by how well your tyres are doing their job (especially in Winter) so it pays to take care of them. So our experts are always on hand to make sure yours are in the best possible condition. *Toyota Centres will match any like-for-like quote within a five-mile radius. Tyre must be identical specification - brand, pattern, load, speed rating, manufacturer marking. Price quotation must be in writing and must be fully fitted including VAT, valve, balancing and disposal charges. **If your tyre can be safely repaired, excluding run flat tyres. surface – so you lose grip and control. 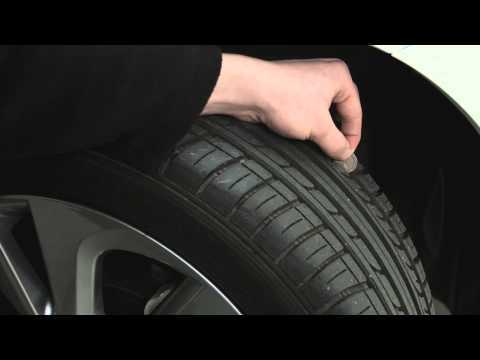 If your car isn’t quite new, or if you haven’t changed your tyres for a while, then it’s a really good idea to check to see how they’re wearing. Place a 20p coin into the main tread grooves of your tyre. If the outer band of the coin is hidden by the rubber, then your tread is above the legal limit of 1.6mm (within the central three quarters of the tread). Check all your tyres match by looking at the tread pattern and make of each tyre as all should be exactly the same. Does your steering wheel vibrate at around 40-50mph? If so, one or more of your tyres needs balancing or replacing. If your car seems to be slowly veering in one direction then your tracking is out, your tyre pressure is unequal or the tread on the front tyres doesn’t match. Check the sides of the tyres for any cracks, splits or blisters; this usually happens on older tyres and it signifies they need replacing. If you’re experiencing any of these issues, or if you just haven’t had your tyres checked professionally for a while, then pop along to your nearest Toyota Dealer and we’ll advise you on the best course of action.